GuardMagic VB4 universal vehicle GPS/ GSM-GPRS module with driver identification function, fuel monitoring function, temperature monitoring function and logical inputs. Module is intended for remote supervision of mobile objects movement (vehicle, special machinery etc.) and vehicle status. Module supports up to THREE regular fuel tanks and up to Four cargo tanks (fuel level sensors with digital communication bus). 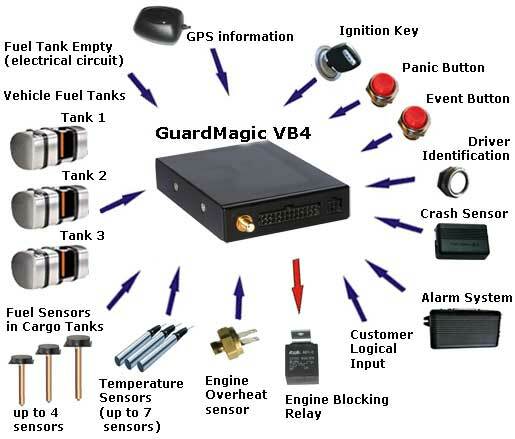 GuardMagic VB4 is an universal base GPS/ GSM-GPRS vehicle module. (GuardMagic VB4 modules support universal communication protocol that's allow to have different GuardMagic modules with different functionality in one system).